In part one, we explored the studies which show that transdermal estrogen delivery is preferable over the oral pill form of delivery. In part two of this series, we will explore further the studies which explain why oral estrogen pills are associated with a hypercoagulability and inflammation causing the observed increase in clots, deep venous thrombosis, pulmonary embolus, and stroke in young women on “the Pill” and in post-menopausal women on oral HRT. (1,7) Transdermal estrogen on the other hand does not cause such effects, making it the safer choice. 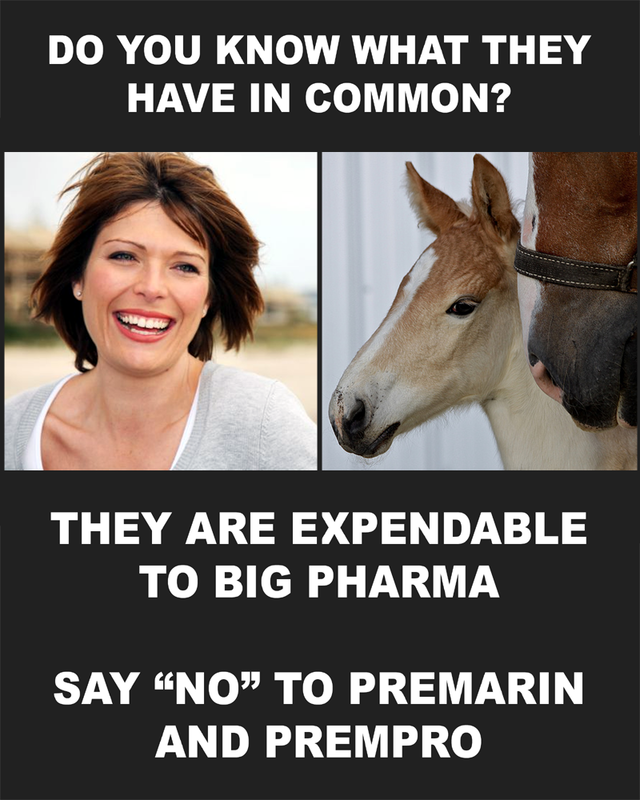 (1)Above left image : Premarin and Prempro are the two most common oral estrogen pills known to cause blood clot formation. Poster courtesy of Tuesday Horse Files. In 1997, Dr. Scarabin studied bioidentical HRT in post menopausal women. He compared oral to transdermal estrogen delivery in 45 post-menopausl women in Paris France. The women were given either oral or transdermal estradiol, along with natural progesterone, and various parameters of the coagulation system were studied. Left Image Prempro pack known to cause blood clots, courtesy of Wyeth, Pfizer. CRP is a non-specific inflammatory marker which increases risk for heart disease. There is overwhelming evidence in the medical literature that oral estrogen increases markers of hypercoagilbility(7) and CRP, while transdermal estrogen has no such deleterious effects. Effects of oral and transdermal estrogen/progesterone regimens on blood coagulation and fibrinolysis in postmenopausal women. A randomized controlled trial. Scarabin PY, Alhenc-Gelas M, Plu-Bureau G, Taisne P, Agher R, Aiach M.
Postmenopausal hormone replacement therapy is associated with a reduction in the incidence of coronary heart disease. However, inconclusive results have been reported with respect to the risk of stroke, and recent studies consistently showed an increased risk of venous thromboembolism in postmenopausal women using oral estrogen. There are surprisingly few interventional studies to assess the true effects of estrogen-progestin regimens on blood coagulation and fibrinolysis, and the impact of the route of estrogen administration on hemostasis has not been well documented. Therefore, we investigated the effects of oral and transdermal estradiol/progesterone replacement therapy on hemostatic variables. Forty-five healthy postmenopausal women, aged 45 to 64 years, were assigned randomly to one of the three following groups: cyclic oral or transdermal estradiol, both combined with progesterone, or no hormonal treatment. Hemostatic variables were assayed at baseline and after a 6-month period. Pairwise differences in the mean change between the three groups were compared using nonparametric tests. Oral but not transdermal estradiol regimen significantly increased the mean value of prothrombin activation peptide (F1 + 2) and decreased mean antithrombin activity compared with no treatment. Differences in fragment F1 + 2 levels between active treatments were significant. The oral estrogen group was associated with a significant decrease in both mean tissue-type plasminogen (t-PA) concentration and plasminogen activator inhibitor (PAI-1) activity and a significant rise in global fibrinolytic capacity (GFC) compared with the two other groups. A transdermal estrogen regimen had no significant effect on PAI-1, t-PA, and GFC levels. There were no significant changes in mean values of fibrinogen, factor VII, von Willebrand factor, protein C, fibrin D-dimer, and plasminogen between and within the three groups. We conclude that oral estrogen/progesterone replacement therapy may result in coagulation activation and increased fibrinolytic potential, whereas opposed transdermal estrogen appears without any substantial effects on hemostasis. Whereas these results may account for an increased risk of venous thromboembolism in users of oral postmenopausal estrogen, they emphasize the potential importance of the route of estrogen administration in prescribing hormone replacement therapy to postmenopausal women, especially to those at high risk of thrombotic disease. Drug Des Devel Ther. 2009 Feb 6;2:193-202. Transdermal hormone therapy in postmenopausal women: a review of metabolic effects and drug delivery technologies. Kopper NW, Gudeman J, Thompson DJ. Source KV Pharmaceutical, 2503 South Hanley Road, St. Louis, MO 63144, USA. Abstract Vasomotor symptoms (VMS) associated with menopause can cause significant discomfort and decrease the quality of life for women in the peri-menopausal and post-menopausal stages of life. Hormone therapy (HT) is the mainstay of treatment for menopausal symptoms and is currently the only therapy proven effective for VMS. Numerous HT options are available to treat VMS, including estrogen-only and estrogen-progestogen combination products to meet the needs of both hysterectomized and nonhysterectomized women. In addition to selecting an appropriate estrogen or estrogen-progestogen combination, consideration should be given to the route of administration to best suit the needs of the patient. Delivery systems for hormone therapy include oral tablets, transdermal patches, transdermal topical (nonpatch) products, and intravaginal preparations. Oral is currently the most commonly utilized route of administration in the United States. However, evidence suggests that oral delivery may lead to some undesirable physiologic effects caused by significant gut and hepatic metabolism. Transdermal drug delivery may mitigate some of these effects by avoiding gut and hepatic first-pass metabolism. Advantages of transdermal delivery include the ability to administer unmetabolized estradiol directly to the blood stream, administration of lower doses compared to oral products, and minimal stimulation of hepatic protein production. Several estradiol transdermal delivery technologies are available, including various types of patches, topical gels, and a transdermal spray. Effect of transdermal estradiol and oral conjugated estrogen on C-reactive protein in retinoid-placebo trial in healthy women. Decensi A, Omodei U, Robertson C, Bonanni B, Guerrieri-Gonzaga A, Ramazzotto F, Johansson H, Mora S, Sandri MT, Cazzaniga M, Franchi M, Pecorelli S.Division of Chemoprevention, European Institute of Oncology, Milan, Italy. The increase in C-reactive protein (CRP) during oral conjugated equine estrogen (CEE) may explain the initial excess of cardiovascular disease observed in clinical studies. Because the effect of transdermal estradiol (E2) on CRP is unclear, we compared CRP changes after 6 and 12 months of transdermal E2 and oral CEE in a randomized 2×2 retinoid-placebo trial. METHODS AND RESULTS: A total of 189 postmenopausal women were randomized to 50 microg/d transdermal E2 and 100 mg BID of the retinoid fenretinide (n=45), 50 microg/d transdermal E2 and placebo (n=49), 0.625 mg/d oral CEE and 100 mg BID fenretinide (n=46), or 0.625 mg/d oral CEE and placebo (n=49) for 1 year. Sequential medroxyprogesterone acetate was added in each group. Relative to baseline, CRP increased by 10% (95% CI -9% to 33%) and by 48% (95% CI 22% to 78%) after 6 months of transdermal E2 and oral CEE, respectively. The corresponding figures at 12 months were 3% (95% CI -14% to 23%) for transdermal E2 and 64% (95% CI 38% to 96%) for oral CEE. In contrast to oral CEE, transdermal E2 does not elevate CRP levels up to 12 months of treatment. The implications for early risk of coronary heart disease require further studies. The effect of transdermal estradiol or oral conjugated oestrogen and fenretinide versus placebo on haemostasis and cardiovascular risk biomarkers in a randomized breast cancer chemoprevention trial. Lazzeroni M, Macis D, Decensi A, Gandini S, Sandri MT, Serrano D, Guerrieri-Gonzaga A, Johansson H, Mora S, Daldoss C, Omodei U, Bonanni B.Source Cancer Prevention and Genetics, European Institute of Oncology, 20141 Milan, Italy. Abstract BACKGROUND:We have previously reported the favourable effect of transdermal estradiol (E2), relative to oral conjugated equine oestrogen (CEE), on ultrasensitive C-reactive protein after 12 months of treatment in a retinoid-placebo controlled two-by-two randomized breast cancer prevention trial (Decensi A et al (2002) Circulation106 10 1224-8). Here, we investigate the changes in lipids and clotting profile in patients of the same trial. METHODS AND RESULTS: Recent post-menopausal women were randomised to either oral CEE 0.625 mg/day and placebo (n = 55), CEE and fenretinide 200 mg/day (n = 56), transdermal E2 50 mg/day and placebo (n = 59) or E2 and fenretinide 200 mg/day (n = 56). Sequential medroxyprogesterone acetate 10 mg/day was given in each group. After 12 months, there was a statistically significant effect of the route of administration of hormone replacement therapy (HRT) on fibrinogen levels; the median percentage change being -5.7% with CEE and -1.1% with E2 (p = 0.012). Total cholesterol decreased in all arms (p < 0.0001). HDL-C decreased significantly with transdermal E2 (p = 0.006) compared to oral CEE and with fenretinide relative to placebo (p<0.001). Triglycerides exhibited an opposite modulation in the HRT route, with a 21.4% median increase with oral CEE and an 8.6% reduction with transdermal E2 (p < 0.0001). Antithrombin-III showed a 4% borderline significant reduction in the fenretinide arm relative to placebo, irrespective of the HRT administration route (p = 0.055). CONCLUSIONS: Our data indicate that transdermal E2 may be preferable to oral CEE based on its safer cardiovascular risk profile. Fenretinide modified some cardiovascular risk biomarkers and confirmed a safer profile compared to other retinoids. Effects of oral and transdermal estrogen replacement therapy on markers of coagulation, fibrinolysis, inflammation and serum lipids and lipoproteins in postmenopausal women. Vehkavaara S, Silveira A, Hakala-Ala-Pietilä T, Virkamäki A, Hovatta O, Hamsten A, Taskinen MR, Yki-Järvinen H.
We compared the effects of oral estradiol (2 mg), transdermal estradiol (50 microg), and placebo on measures of coagulation, fibrinolysis, inflammation and serum lipids and lipoproteins in 27 postmenopausal women at baseline and after 2 and 12 weeks of treatment. Oral and transdermal estradiol induced similar increases in serum free estradiol concentrations. Oral therapy increased the plasma concentrations of factor VII antigen (FVIIag) and activated factor VII (FVIIa), and the plasma concentration of the prothrombin activation marker prothrombin fragment 1+2 (F1+2). Oral but not transdermal estradiol therapy significantly lowered plasma plasminogen activator inhibitor-1 (PAI-1) antigen and tissue-type plasminogen activator (tPA) antigen concentrations and PAI-1 activity, and increased D-dimer concentrations, suggesting increased fibrinolysis. The concentration of soluble E-selectin decreased and serum C-reactive protein (CRP) increased significantly in the oral but not in the transdermal or placebo groups. In the oral but not in the transdermal or placebo estradiol groups low-density-lipoprotein (LDL) cholesterol, apolipoprotein B and lipoprotein (a) concentrations decreased while high-density-lipoprotein (HDL) cholesterol, apolipoprotein AI and apolipoprotein All concentrations increased significantly. LDL particle size remained unchanged. In summary, oral estradiol increased markers of fibrinolytic activity, decreased serum soluble E-selectin levels and induced potentially antiatherogenic changes in lipids and lipoproteins. In contrast to these beneficial effects, oral estradiol changed markers of coagulation towards hypercoagulability, and increased serum CRP concentrations.Transdermal estradiol or placebo had no effects on any of these parameters. Cardiovasc Res. 2006 Apr 1;70(1):22-30. Epub 2006 Jan 17. Controversies regarding hormone therapy: Insights from inflammation and hemostasis. Koh KK, Yoon BK. Source Vascular Medicine and Atherosclerosis Unit, Division of Cardiology, Gil Medical Center, Gachon Medical School, Incheon, Korea. Abstract Many observational studies and experimental and animal studies have demonstrated that estrogen therapy (ET) or hormone therapy (HT) significantly reduces the risk of coronary heart disease. Nonetheless, recent randomized controlled trials and the Nurses’ Health Study in secondary prevention demonstrate trends toward an increased risk of cardiovascular events rather than a reduction of risk from HT. HT has both anti-inflammatory and pro-inflammatory effects, and it activates coagulation and improves fibrinolysis. These effects depend on the route of administration, doses of estrogen, age of women, and the presence of coronary artery disease or the coexistence of other risk factors for hypercoagulability. In this review, we discuss effects of HT on markers of inflammation, hemostasis, and fibrinolysis that may link endothelial dysfunction in cardiovascular diseases. We also briefly discuss effects of lower doses of HT and tibolone in postmenopausal women. The effects of hormone replacement therapy (HRT) on hemostatic variables in women with previous venous thromboembolism–results from a randomized, double-blind, clinical trial. Høibraaten E, Qvigstad E, Andersen TO, Mowinckel MC, Sandset PM. Source Department of Hematology, Ullevål University Hospital, Oslo, Norway.In a recent randomized, double-blind, placebo-controlled trial of women with a history of venous thromboembolism (VTE), we found that hormone replacement therapy (HRT) was associated with an early excess risk of recurrent thrombosis. The aims of the present study were to characterize the effects of HRT on coagulation in these women to elucidate the mechanism(s) by which HRT increases the risk of thrombosis. The study comprised 140 women who were randomized to receive continuous treatment for 24 months with once daily 2 mg 17-beta-estradiol plus 1 mg norethisterone acetate (n = 71) or placebo (n = 69). HRT caused significant increases in prothrombin fragments 1+2, thrombin-antithrombin complex, and D-Dimer after 3 months, but these changes were less pronounced on prolonged treatment. The increases in markers of activated coagulation was higher in those women who subsequently developed recurrent thrombosis, but was similar in carriers and non-carriers of the factor V Leiden mutation. HRT had no effects on fibrinogen and factor VIII. Activated factor VII, but not factor VII antigen, decreased significantly on HRT as compared with placebo. The coagulation inhibitors antithrombin, protein C, and TFPI, but not protein S, all showed significant sustained decreases in the HRT group as compared with placebo. Antithrombin and protein C decreased by 8-12% on HRT, whereas TFPI activity decreased by 12-17% and TFPI free antigen by 29-30%. In multivariate analysis, only TFPI activity was a significant predictor for the increased activation of coagulation. We conclude that HRT was associated with early activation of coagulation, which corroborates the finding of an early risk of recurrent VTE. This activation may in part be explained by reduction in circulating anticoagulants. We explored the studies which show that transdermal estrogen delivery is preferable over the oral pill form of delivery. This entry was posted in Blood Clot, DVT, Heart Disease, Oral Estrogen, Prempro, Transdermal and tagged clot, crp, DVT, orelestrogen, prempro, stroke, transdermal by Jeffrey Dach MD. Bookmark the permalink.